Just a quick note for the blog to show off my three new listings over in my Etsy shop. At $15 each, with $3.50 shipping, these are an amazing deal. 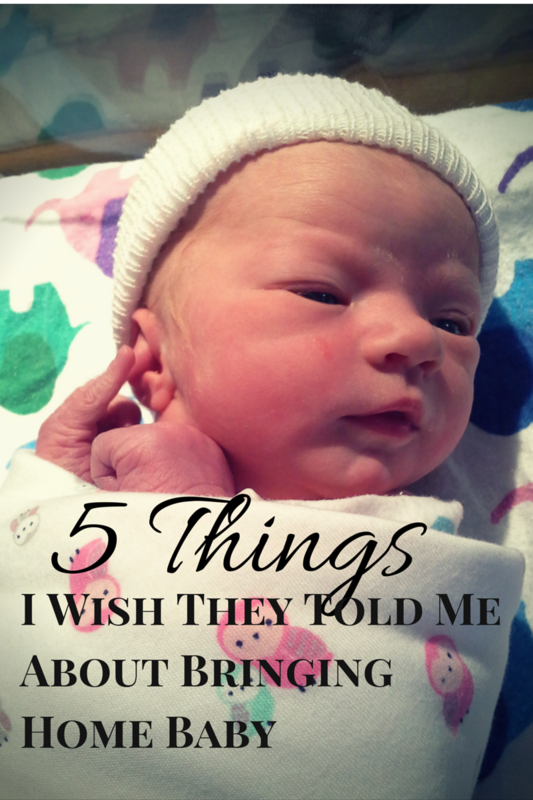 Go have a look and let me know what you think! Feedback and custom orders are always welcome. 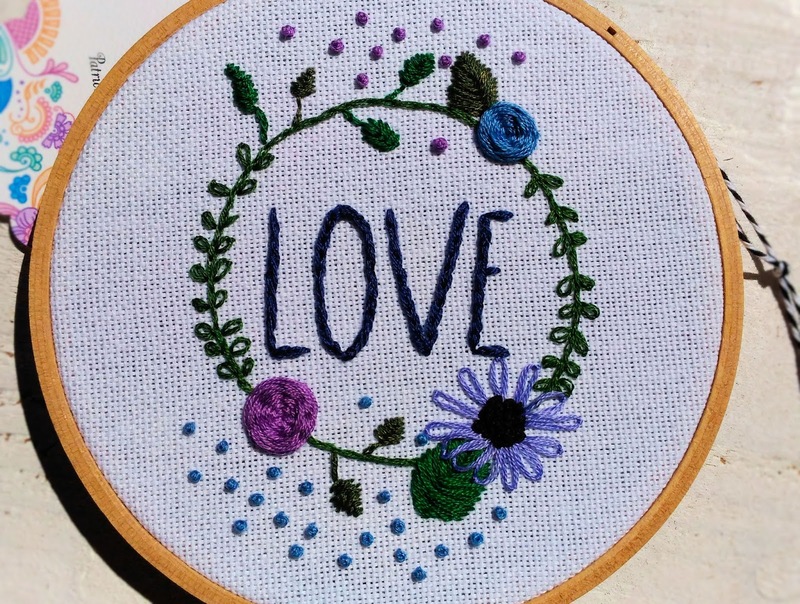 The first hoop is a floral wreath around the word 'love'. A beautiful reminder we all need. 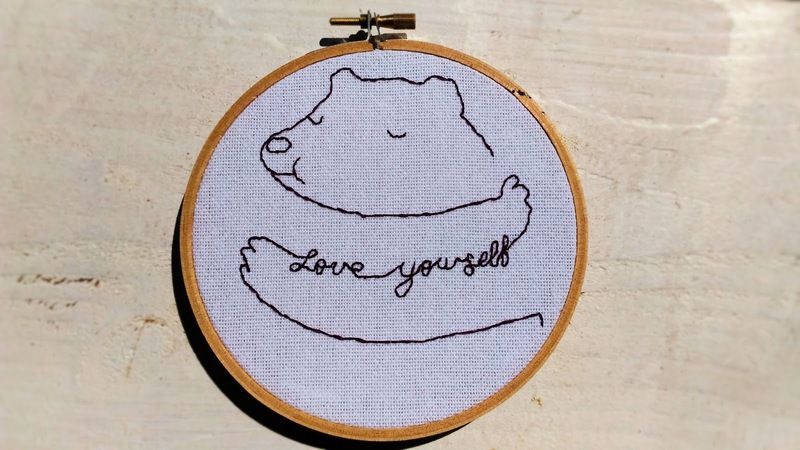 The second is a reminder to love yourself with a bear giving himself a hug. The final listing is an anonymous naughty copulating couple done in a tasteful, minimalist manner. I really love this one and am going to shed a tear when it leaves me! Leftover mashed potatoes have pretty much always been a given in my life. 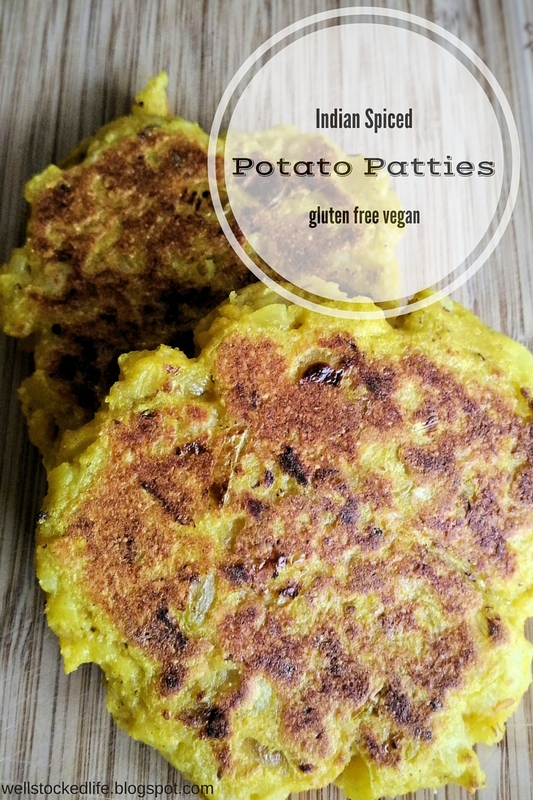 From the time I was little, I can always remember looking forward to the next day's mashed potatoes that would be magically morphed into crispy little patties. The beautiful thing about potatoes is that they serve so well as a backdrop for so many different flavors. Beyond the traditional butter, garlic, and onion combo that I hold so dear to my heart, I really enjoy Indian spiced potatoes. If you've ever had the pleasure of eating a dosa, I try to aim for something reminiscent of the dosa stuffing that I love so much. Of course my potatoes are nowhere near as good, but this recipe is a pretty easy way to jazz up potatoes and maybe try something new. First... Wash and spot peel the potatoes. Cut into 1/2" cubes and place in a pot of boiling salted water. Boil until potatoes are fork tender and ready to be mashed. Drain and return to pot. Set aside. Then... While the potatoes are boiling, heat a large nonstick skillet over medium heat and dice the onion and garlic. Once hot, roast the peppers, cumin, salt, and mustard for one to two minutes, or until fragrant. Add 2 tbs olive oil to skillet, followed by the onion and garlic. Cook for five minutes, or until onions begin to soften. Add turmeric, stir well, then add potatoes to the skillet. In the potato pot, combine 1/2 cup of soy milk and the flaxseed and heat over low. Finally... While waiting on the milk and flaxseed mixture to heat, use a fork or potato masher to mash the potato and onion mix. Add the soy milk, masa, and 1 tbs olive oil to the potatoes and mix well. 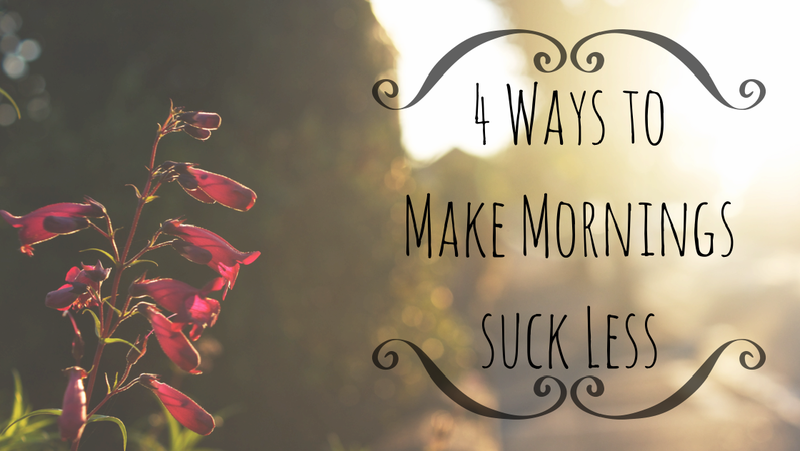 Add more soy milk as needed to achieve the needed consistency. Wipe out the skillet from earlier and return to medium heat. With your hands, shape the potato mixture into patties and cook for five minutes per side, or until a golden crispy layer forms. 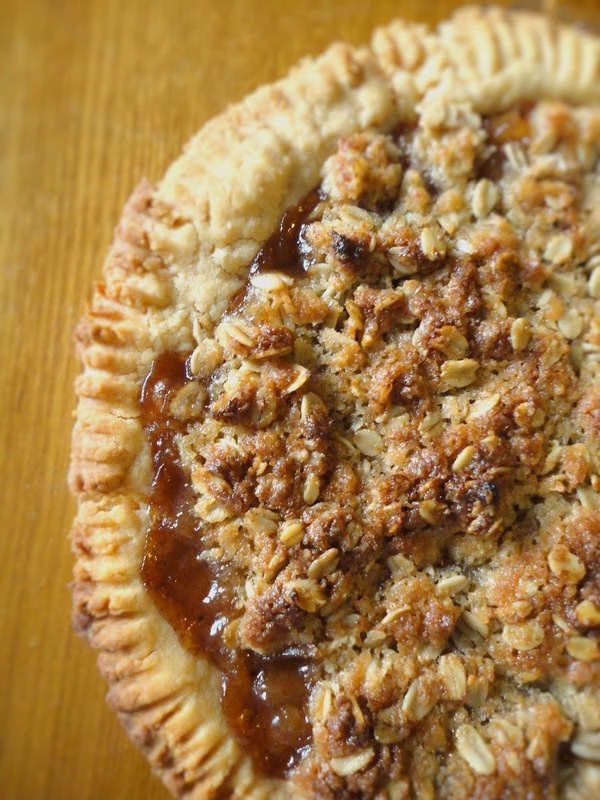 This month’s Mid-Month Munchies comes to you directly from my kitchen in the form of pie! This is pretty exciting business, folks. Any time there is pie involved, my attention is undivided – at least as much as it can be with a five-month-old. 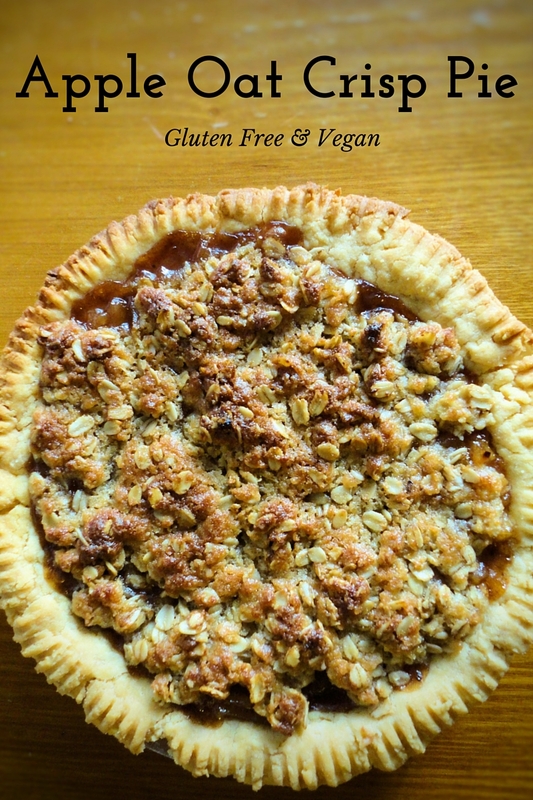 This pie was born out of my frustration at a lack of decent gluten free pie toppings. Pre-Celiac I was in love with lattice work on top of pie. Gluten-free dough is notoriously fragile and does not lend well to lattice work, or much other pie toppings. Even getting a solid flat crust for topping can be a challenge. It is no fun to top a delicious pie with a mediocre crust. I’m the kind of person that would just rather not do something if it isn’t going to come out well, so I began experimenting with different toppings I could use. The topping I use here is along the same vein as the toppings used for summertime berry cobblers. Used in pie it is a lovely, crunchy contrast to the fruit filling and sets it apart from other pies in a fun way. Apple is usually my go-to pie filling as you can easily control how much added sugar goes into the filling and it is so quick to make. I love this pie so much and hope you will too! So easy and quick to make. Let me know how yours turns out! First... Preheat the oven to 350. Prepare your favorite pie crust as desired. Peel, slice, and core your apples, then place into a large mixing bowl. Coat well with cornstarch, sugar, and pie spice. Then... Melt the butter over a low heat then add the sugar and pie spice. Stir well, then add the oats and remove from heat. Finally... Dump the bowl of apples into the pie crust. Dot with the divided butter. Add the oat topping to the apples and spread evenly around. Crumbling with your fingers will help to even things out. Bake for 20 - 25 minutes or until starting to brown on top. If you edges are burning, cover them with foil.